London, population of 432,451, is located in the heart of SouthWestern Ontario. It is home to one of the country's leading universities, the University of Western Ontario and the London Health Sciences Centre. A very diversified city of culture, entertainment, lifestyles and economic development. London was first settled by Europeans in 1826 and was incorporated as a city on January 1, 1855. Since then, London has grown into the largest Southwestern Ontario municipality and the city has developed a strong focus towards education, health care, tourism, manufacturing, economic leadership and prosperity. With the City's close proximity to such large urban centres such as Toronto, Detroit, Chicago and New York, it is a place of growth and development. The City of London is a single-tier municipality, politically separate from Middlesex County though it remains the official county seat. London's diverse cultural offering boosts its tourism industry. 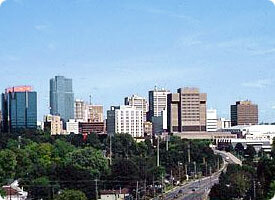 The city is home to many festivals throughout the summer including the London International Children's Festival, the Home County Folk Festival, the Taste of London festival, London Ribfest which is the second largest rib festival in North America  and Sunfest, a World music and culture festival the second biggest in Canada after Caribana in Toronto . Musically, London is home to Orchestra London, a professional symphony orchestra, the London Youth Symphony and also the Guy Lombardo Museum. There are several museums and theatrical facilities including Museum London, which is located at the Forks of the Thames. Museum London exhibits art by a wide variety of local, regional and national artists including Paul Peel and Greg Curnoe. London is also home to the Museum of Archaeology, owned by the University of Western Ontario (UWO), with a reconstructed Iroquois village, the McIntosh Gallery which is an art gallery on the UWO campus and The Grand Theatre which is a professional theatre with a secondary stage named the McManus Studio.